After many years of relentlessly chasing the summer flounder, I have come to accept my status as a certifiable “flounder pounder”. Fluke are one of the few species I catch that I keep for the table which is one small reason for my interest. Additionally, they are a summertime species that can readily be caught during the daytime in bright sunny conditions. Gulp Saltwater bait rigged and ready to catch fish. Throughout my life, I have always most enjoyed catching fish on artificial lures. The simplicity of tying on a hard or soft plastic bait and just catching fish without worrying about the scent and taste factor is very appealing to me. But, as fluke anglers know, the approach has always been live or dead bait, alone on a hook or in conjunction with spinners, attractors and jigs. I accepted this long ago and routinely arm myself with the usual fluke baits of squid, sand eels and spearing as well as various other baits like fluke bellies, bluefish strips and mummies. But, the desire to find a fluke lure that would catch fish just as well as live or dead bait continued to elude me. That is, until a new soft plastic lure variation hit the market, Berkley GULP! and Berkley GULP! Alive. The GULP! 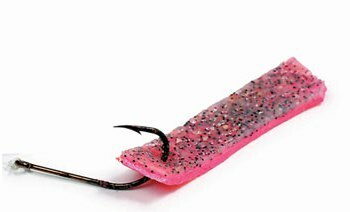 product line is an assortment of soft plastic body variations developed to be biodegradable and to disperse more scent that any other scented baits on the market. The 4” Swimmin’ Mullet immediately attracted me. This seemed like a perfect trailer for a Spro bucktail jig. This is where I decided to begin my experiment. 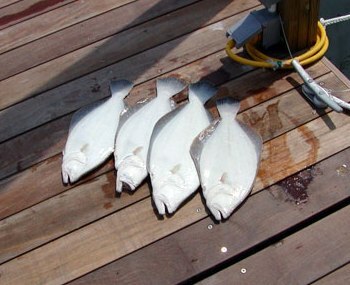 A rack of Fluke caught on Gulp Saltwater baits. The early part of the season usually finds fish in shallow water, often less than 10 feet. Drifting the 10-20 foot zones off the beaches, I deployed one GULP! baited jig over the side and dropped the rod in the rod holder. This would be my dead stick rod. The second jig was sent overboard and I used an aggressive snap jigging technique. As I’m focusing on the lifting and falling rhythm of my jig I glance back at my dead stick to find the rod tip bouncing! I quickly switched rods and cranked up my first GULP! fluke! The dead stick rod continued to catch fish and throughout the rest of the tide the fluke just hammered the snap jig as it would fall back to the bottom while using an aggressive jigging motion. These techniques continued to work day after day while the fish were feeding in shallow waters.